Maha Shivrathri in February-March; Aipasi Poornima-full moon day in October-November; Panguni Utsav in March-April and Margazhi Tiruvadhirai in December-January are the festivals celebrated in the temple. 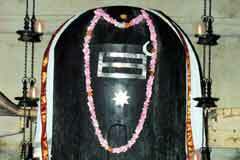 The Shiva Linga in the temple is the biggest in size among the Lingas in Tamilnadu temples. This is made of a single lime stone 200 metres far from the sanctum sanctorum and placed on ground. Sun light falls on the Nandhi each day reflecting on the Linga. Even if all lights in the sanctum are put off, devotees can see the Lord in the sunlight. This is an outstanding evidence of the rare skill of sculptors of Tamilnadu with no parallel elsewhere. The shadow of the Kalasa on the tower does not fall on ground. A rare stone called Chandrakanta stone is installed under the Linga which has a strange characteristic of making the sanctum sanctorum cool in summer and warm in winter. 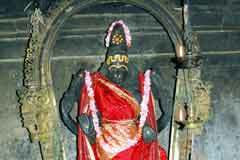 Mother Periya Nayaki, as Her very name suggests, is 9.5 feet tall standing majestically. The Navagrahas the nine planets are made of a single stone on Lotus design peeta. This is other rare individuality of the temple. The temple is open from 6.00 a.m. to 12.00 a.m. and 4.00 p.m. to 8.00 pm. Sri Bragadeeswarar Temple, Gangaikonda Chola Puram, Ariyalur district. Mothers Saraswathi and Mahalakshmi grace in the temple in a meditation form, hence are praised as Gnana Saraswathi and Gnana Lakshmi. 500 pots of milk are used for abishek of Mother Durga during the Panguni festival. Devotees pray to Mother Durga for wedding, child boons, for promotion in jobs, transfers to a place of choice offering archanas. Realizing their wish, devotees offer 25 meter long dhoti with a 14 ft. garland to Lord and 9 yards Sari to mother. The Shiva Linga in the temple is bigger than the one at Thanjavur temple. Thanjavur Linga is 12.5 feet tall on an Avudayar of a circumference of 55 feet. The Linga in Gangaikonda Cholapuram temple is 13.5 feet tall placed on a Avudayar of 60 feet circumference. Planks are provided around the Linga to stand on to facilitate abishek pujas. It is also said that the Thanjavur Linga is masculine with pounding stone design (Ural in Tamil), the one in this temple is feminine in nature with Udukkai design. The Nandhi the bull vehicle of Lord Shiva is also bigger than of Thanjavur. The Nandhi in Thanjavur is made of a single stone and placed on a high level mandap. The Nandhi in this temple is made of lime stone and placed on the ground. In Thanjavur, the Nandhi is 100 meters away from the sanctum, in this temple, the distance is 200 meters. Rays of Sun fall on the Nandhi each day and reflect on the Lord in the sanctum. The devotee can have a pleasant darshan of Lord even after putting off all lights, simply with sunlight. This is a rare sculptural skill exclusively of Tamilnadu. A stone, called Chandrakanta stone is installed under the Linga with a rare power of making the place cool during summer and comforting warmth during winter. This is experienced by generations of priests of the temple. It appears that no temple has such an environment pleasure. Annabishekam is performed and celebrated in the temple on Aipasi full moon day by Sri Kanchi Kamakoti Peetam Mutt for quite a number of years. Hundreds of bags of rice are cooked for the purpose to cover this biggest Shiva Linga. This abishek begins at 9.00 a.m. on the day and continues till 4.00 p.m. More nivedhanas are offered to Lord prepared with vegetables and fruits. The Annabisheka Linga darshan is made available to the devotees from 6.00 p.m. to 9.00 p.m. As a tradition this Anna-rice is dissolved in rivers later. In this temple, the same is offered as Prasad taken from the Avudayar part of the Linga. The rice on the Linga is not offered as humans cannot bear its power, it is said. Those seeking child boon are particular to get the Prasad and consume it. 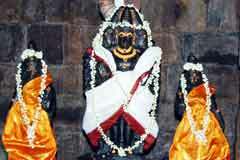 Mother Periya Nayaki, as the very name suggest is tall and big in size. The devotee has to raise his/her head to worship the Mother to see Her merciful face. His Holiness Sri Chandrasekhara Saraswathi of Kanchi Kmakoti Peeth had installed a Sri Chakra at the feet of the Mother. People say that only after the installation of the Sri Chakra by Kanchi Seer, the crowd began to swell in the temple. Navagrahas the nine planets are together on a lotus shaped peeta made of a single stone. The planets are around Sun on a Rath drawn by 7 horses. Aruna is the Sarathi-Rath driver. The mandap is so structured that devotees cannot circumambulate the Navagras, because they go round the world and humans should not go round them, according to one theory. Mother Durga in the temple graces the devotees as a 9 year old pretty smiling little girl with 20 hands killing demon Mahishasura. 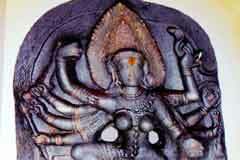 She is the family deity of King Rajendra Chola. This is a rare form of Mother Durga praised as Mangala Chandi. People pray to her for wedding and child boons, employment and transfers to place of choice offering archanas. Rajendra Chola used to offer his worship first to Mother Durga and then only to Lord Shiva. Remembering this tradition, on Sundays devotees offer their first prayers in Durga Shrine before praying to Lord Shiva. 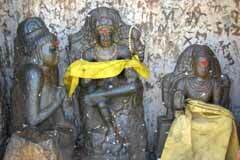 Rajendra Chola called his Minister and demanded accounts for the temple construction. Minister was unable to submit the account correctly. He fell at the feet of Lord Vinayaka who restored his memory. Minister recollected the account as 8 thousand copper for Kavi (saffron) stones and 8 thousand copper for Kavi threads and so on. 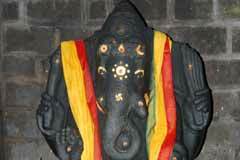 Hence, this Vinayaka was called Kanakku Vinayaka (accountant Vinayaka) presently praised as Lord Kanaka (Gold) Vinayaka. He appears with a pen (Ezhuthani in Tamil) in His right hand. 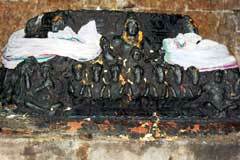 The Rajagopuram of the temple is testimony to Chola temple architecture. As in Thanjavur, the tower was built only after installation of Lord. 216 feet tall Tanjore Tower was built on a single base going up gradually in an even manner. The 180 feet tall tower in Gangaikonda Cholapuram temple has a base of 100 feet width up to 100 feet height. The base is reduced to 80 feet width after this level. The shadow of the tower does not fall in the ground. The Vimana-tower above the sanctum in the temple is the second biggest next to Thanjavur. 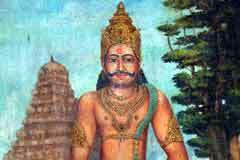 Rajendra Chola was born to King Rajaraja Chola and Queen Tribhuvana Madevi on the Margazhi Tiruvadhirai day. He was named Maduranthakan. He ruled from 1012 to 1044 AD. He conquered many countries crossing the sea including Kadaram and came to be known as Kadaram Kondan – Conqueror of Kadaram. He built a temple for Lord Shiva as his father did in Thanjavur and named the Lord and Mother, Bragadeeswarar and Periyanayaki as in the first temple. He brought the abishek water from Ganga for consecration carried by kings defeated by him. Hence the name of the place, Gangai Konda Chola Puram. Rajendra dug a well in the temple and made the abishek water fall in the well. 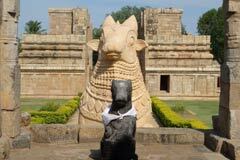 He also made a Lion statue, the symbol of the Chola dynasty and placed it on the well. While visiting the temple, he will spill this water on his head before worshipping the Lord. The whole temple is built with rocks. The Shiva Linga is biggest in Tamilnadu. Dhotis and upper cloth are specially woven for the Lord to cover the size. Chandikeswara in the temple is all powerful. Scientific Based Nandhi in the temple is made of lime stone and placed on the ground. The gap between Nandhi and the sanctum sanctorum is 200 meters. The rays of Sun fall on Nandhi each day reflecting on the Lord. The sanctum sanctorum will be very bright with the reflection of sun rays even if all the lights are put off. 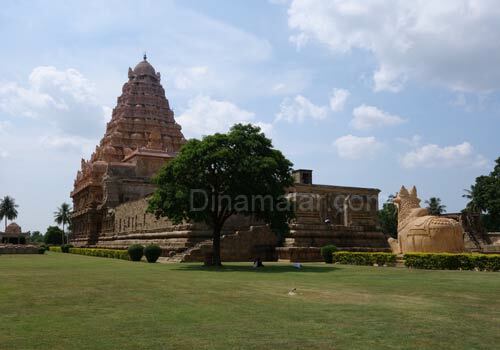 Gangaikonda Cholapuram is 35 Kms far from Kumbakonam on the Chennai road.